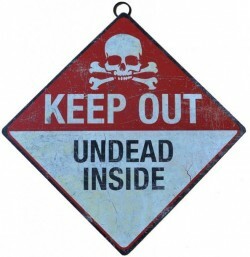 Metal zombie warning sign designed for wall display complete with attached hanging ring. Dimensions: 21.5cm x 21.5cm (8 inches). Height of sign: 30 cm (12 inches). Measurement does not include hanging ring.